A small urban square in the heart of Wimbledon, London. 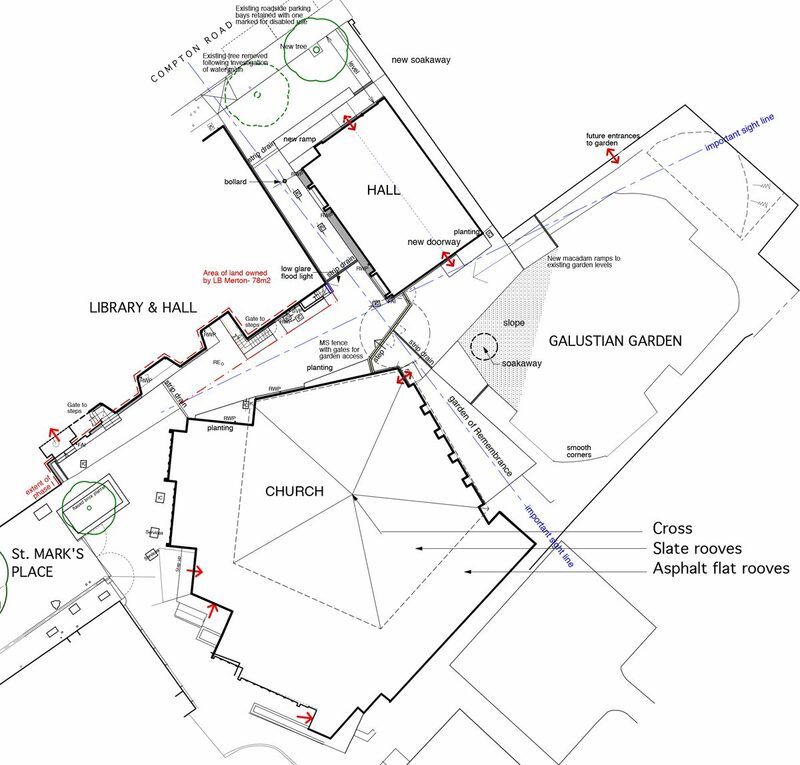 At its east end is an unusual pentagonal church, with the spaces around, next to the library, community centre, and church garden, in need of attention. These spaces form important secondary pedestrian routes through the fabric of the city close to a major transport interchange and centre of value. An opportunity for a protected and lively environment drawing on the activities in the area: restaurants, shops, businesses, wine bar, one of Wimbledon's finest pubs, fruit stall, library all happening around St Mark's Place. The Bridge House Trust granted St Mark's Church and Community Centre some £90,400 to improve access and security to the community centre and garden, and to carry out specific improvements to the Hall. MBA working with Groundwork Merton delivered a scheme for the renewal of this important urban space, bringing into the equation local businesses, residents associations, and the London Borough of Merton. As a result we were able to remove a fence and wall dividing up the pedestrian space, open up views to the garden through secure but transparent gates and railings, provide new entrances and facilities within the hall, and resolve the level differences so that the route and its... Read more. A small urban square in the heart of Wimbledon, London. At its east end is an unusual pentagonal church, with the spaces around, next to the library, community centre, and church garden, in need of attention. These spaces form important secondary pedestrian routes through the fabric of the city close to a major transport interchange and centre of value. An opportunity for a protected and lively environment drawing on the activities in the area: restaurants, shops, businesses, wine bar, one of Wimbledon’s finest pubs, fruit stall, library all happening around St Mark’s Place. The Bridge House Trust granted St Mark’s Church and Community Centre some £90,400 to improve access and security to the community centre and garden, and to carry out specific improvements to the Hall. MBA working with Groundwork Merton delivered a scheme for the renewal of this important urban space, bringing into the equation local businesses, residents associations, and the London Borough of Merton. 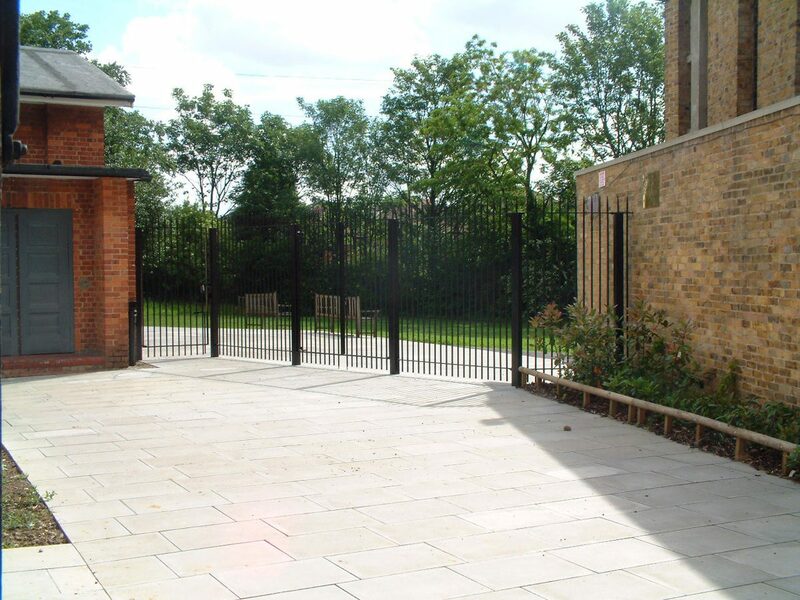 As a result we were able to remove a fence and wall dividing up the pedestrian space, open up views to the garden through secure but transparent gates and railings, provide new entrances and facilities within the hall, and resolve the level differences so that the route and its surrounding buildings became accessible for all. The project was opened by the bishop of Bath and Wells on 24th April 2002.